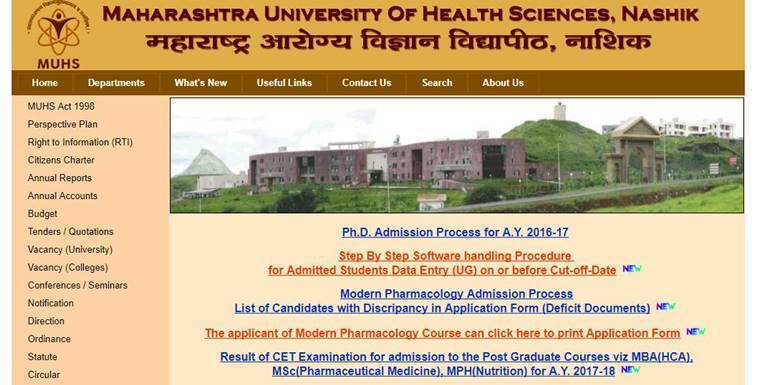 Maharashtra University of Health Sciences (MUHS) will soon release the results of the postgraduate common entrance test (PG CET) 2017. Candidates who have appeared for the entrance can check their result from the official website today. Those who have cleared the exam are eligible for admission to Master of Business Administration Health Care Administration (MBA HCA), Master of Science (MSc) in pharmaceutical medicine and Master of Public Health (MPH) in Nutrition courses at the university. Step 2: Click on the notification that reads “Result of CET Examination for admission to the Post Graduate Courses viz MBA(HCA), MSc(Pharmaceutical Medicine), MPH(Nutrition) for A.Y. 2017-18”. Step 3: Scroll down the list that opens. Locate your name and roll number. The university has also displayed the marks obtained in MUHS PG CET 2017. Step 4: Download the result and save a copy for further reference.